Dobbins Air Reserve Base, Georgia, U.S.
22 AF is responsible for recruiting and training reservists and for maintaining subordinate units at the highest level of combat readiness. A by-product of training is to coordinate daily support of the active duty air force. 22 AF's wartime mission is to provide combat-ready airlift and support units and augments personnel requirements to Air Mobility Command in the United States. Twenty-Second Air Force manages more than 25,000 Reservists and has 149 unit-equipped aircraft. Reserve crews in 22 AF fly the C-130 Hercules, including the WC-130 "Hurricane Hunter" aircraft, which are located at nine different Air Force Reserve wings. The wings, flying squadrons and support units are spread throughout nine states – from New York to Mississippi, Ohio and Minnesota, with its westernmost wing in Colorado Springs, Colorado. Established as the Domestic Division, Air Corps Ferrying Command in the early days of World War II, the organization's mission was the transport of newly produced aircraft from points within the United States to Ports of Embarkation for shipment to Britain and other overseas Allies. In 1946, the organization was transferred to Air Transport Command and became, in essence, a military airline its Continental Division, managing transport routes within the United States. When the USAF was created as a separate service in 1947, Military Air Transport Service was established to support the new Department of Defense, with responsibility for its support falling to the Department of the Air Force. Redesignated Western Transport Air Force (WESTAF), the organization managed all MATS operations from the Mississippi River west to the east coast of Africa until MATS was replaced by the Military Airlift Command in 1966. When MATS became MAC, WESTAF was redesignated 22d AF, with headquarters at Travis AFB, CA. During the 1960s, Twenty-Second Air Force transports flew missions worldwide, supporting the efforts of the United States in Southeast Asia, Europe and other places around the world. In December 1974, the Twenty-Second Air Force absorbed Tactical Air Command's Twelfth Air Force C-130 Hercules tactical airlift operations. On 29 March 1979, the Twenty-Second Air Force assumed responsibility for managing Military Airlift Command resources in the Pacific. 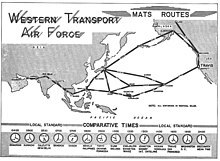 For this mission, the unit provided a single commander for MAC airlift units in the Pacific theater; command and control of theater-assigned airlift forces for Pacific Air Forces; theater tactical airlift war planning and Pacific exercise planning; and aerial ports in the Pacific area to support the air movement of personnel, cargo, equipment, patients, and mail. The division participated in tactical exercises such as Team Spirit, Ulchi Focus Lens, and Capstan Dragon. The unit was relieved from assignment to Military Airlift Command and assigned to Air Mobility Command on 1 June 1992. Activated the same day at Dobbins ARB, GA, with a change in assignment to the Air Force Reserve. It is under the peacetime command of Headquarters Air Force Reserve Command at Robins Air Force Base, GA.
Eastern Sector, Air Transport Command, 25 – 31 Mar 1944. 1501st Air Transport Wing (later 1501 Air Transport Wing, Heavy), 25 Jun – 1 Jul 1958; 8 May 1960 – 8 Jan 1966. 1705th Air Transport Group (later Air Transport Group, Heavy), 24 Jan 1953 – 1 Jul 1957, 24 Jun 1958 – 18 Jun 1960. 1706th Air Transport Group (Air Evac) (later 1706 Air Transport Group, Medium [Air Evac]; 1706 Air Transport Group, Light [Air Evac]), 1 Feb 1953 – 8 Nov 1956. 1708th Ferrying Group (later 1708 Wing), 16 Jul 1951 – 1 Mar 1958. Air Transport Squadron (VR-3), USN, 1 Oct 1948-c. Dec 1948, 1 Dec 1949 – 1 Jul 1957. 1941 establishments in Washington, D.C. This page was last edited on 17 February 2019, at 00:18 (UTC).